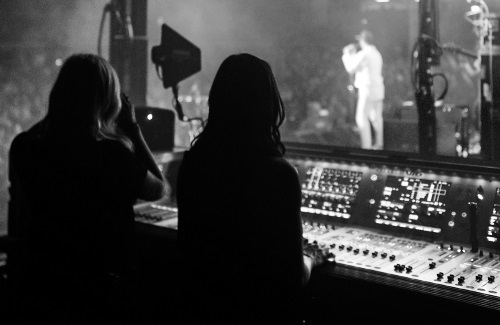 Behind the scenes with an up-and-coming touring monitor engineer who's found her happy place. Olpin with a colleague posted stage left with Fitz and The Tantrums. When I spoke recently with Whitney Olpin, she sounded perfectly content to be off tour and home in Los Angeles, just watching the rain come down. “The city needs a bath,” she says, although not so long ago, she wouldn’t have been quite as content to be between gigs. It was a “slow burn” for Olpin to get where she is now with her career, and while she’s relatively new to the road, she’s put a lot of miles behind her to reach that goal. “It felt like forever getting my feet off the ground,” she notes. Since doing so, however, she’s worked steadily, handling monitors for artists such as Melody Gardot, Lauryn Hill, Toni Braxton, Fitz and The Tantrums, Dirty Heads and Sublime With Rome. 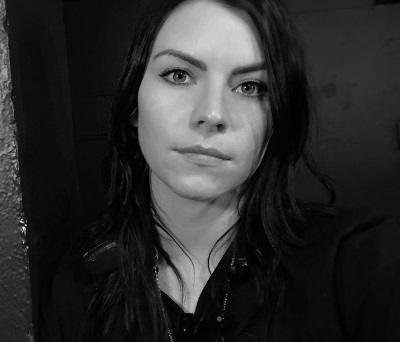 Whitney Olpin backstage prior to a show, ready to take the helm at monitors. Growing up in Salt Lake City, singing was her passion, something she did both in the Mormon church and with the Salt Lake Children’s Choir. Following the divorce of her parents, she and her mother relocated to the Sunshine State, with both the move and divorce making an impact. Sometimes she went to shows without even knowing who was playing, just to soak up the energy. She was fascinated by the production, the music and the overall scene. Olpin switched to studying jazz piano and improvisation; a better fit, initially, until she came to realize that it too might not be a viable career option. She approached a member of the faculty (a “killer” music teacher, she notes) seeking advice on future plans, and he counseled pursuing live sound or something on the management side of production. The former was a far better fit for her A-Type personality and her love of music. “UCLA and USC offered music business degrees, but that’s not what I wanted,” she explains. “Plus, do you know how expensive that is? I don’t have a trust fund. It’s crazy.” She also flew to Florida and looked into Full Sail University, but that didn’t seem like the right fit either. However, the Santa Monica Art Institute offered an audio engineering/science degree where she could apply the credits she’d earned previously. “I was trying to be frugal,” she adds. But after six months, the price of admission, the four-year timeframe and her desire to get some real-world experience led her to yet another option.